The PressureWave™ series are superior quality, versatile pressure tanks. Models are available from 2 to 150 liters, with a maximum working pressure of 10 bar, making them ideal for a range of applications. The Challenger™ range of carbon steel tanks are available from 60 to 450 liters, with a maximum pressure of 10 or 8.6 bar (for tanks sold to NPT markets). Ideally suited to a wide range of applications including booster systems, thermal expansion, heating expansion, irrigation systems and hydraulic hammer arresting. The C2Lite CAD™ series tanks are lightweight and high quality, offering maximum working pressures of 8.6 bar. With no corrosive parts, the C2Lite CAD™ series tanks are appropriate for demanding environments, and ideally suited for coastal, marine and other locations where metal tanks are not suitable. The SuperFlow™ series of tanks come with replaceable membranes and offer capacities of up to 10,000 liters, with maximum working pressures of up to 25 bar. Applications include booster systems, heating expansion, irrigation systems and hammer arresting in high-rise and multi-story buildings such as hotels, hospitals and business centers. Suitable for high pressure applications the 16 bar Max™ series and 25 bar UltraMax™ series are available in a range of sizes and are suitable for various applications. 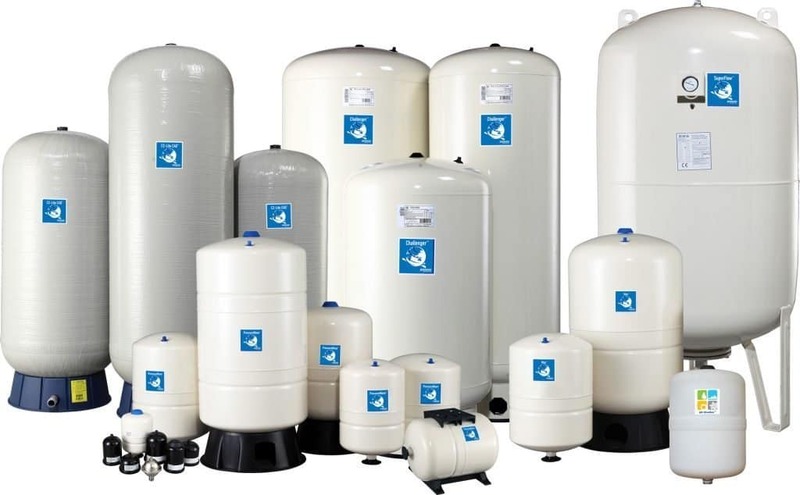 The FlowThru™ range of tanks eliminates the possibility of stagnant water, reducing the risk of waterborne bacteria such as Legionella which can cause Legionnaires disease. Ideally suited to a wide range of applications including pressure booster systems, HVAC systems, and cooling tower applications as well as others. The All-Weather™ series is a range of tanks with a patented Plasteel™ shell. This impenetrable shell makes All-Weather™ tanks ideal for installations in demanding weather conditions such as rain, snow and sun, and makes them the perfect solution for other tough environments such as marine and mining applications. The M-Inox™ Series is a range of stainless steel tanks for special demands and environments such as in the aerospace, pharmaceuticals and food handling industries; or other applications and environments where an extremely high standard of cleanliness might be required or extra care is needed. The HydroGuard™ series has been specifically designed for hydraulic hammer arresting applications. Featuring the latest diaphragm technology, HydroGuard™ shock arrestors are built to reduce or eliminate hydraulic shock, otherwise known as water hammer. They can be plumbed directly into pipework to reduce water hammer produced by quick closing valves, or mounted onto pumps to reduce damage to the pump body caused by water hammer.